Inscriptions: u.l. handwritten in ink: "#7"; u.r. handwritten in ink: "Is there some way I could see this when it's enlarged (before printing) so that I can check on the placement of the words. I want them to look as they do on the rough - but that's pretty rough. "; l.c. handwritten in ink: "1 part D 25 L4 / 1 part D 25 W 2"; l.c. handwritten in ink: "D 25 R4"; r.c. handwritten in ink: "1 part D25 R5 / 1 part D25 W2"; r.c. hadnwritten in ink: "1 part D25 N 1 / 8 parts D25 Y7 / words"
"Untitled." Corita Kent in the Grunwald Center Collection. 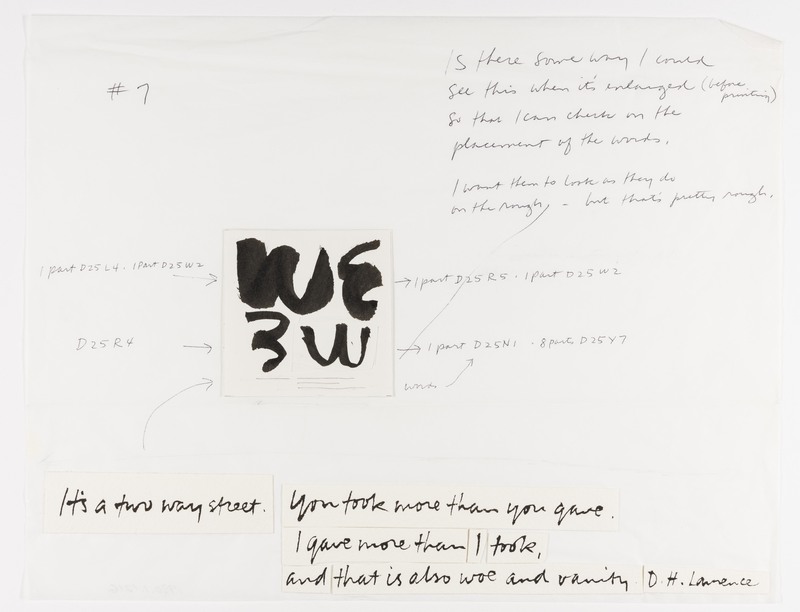 Los Angeles: Hammer Museum, 2017. https://​hammer.ucla.edu/​collections/​grunwald-center-collection/​corita-kent/​art/​untitled-layout-for-high-cards-its-a-two-way-street-you-took-more-than-you-gave/​.